Fresh from my well-earned holiday after a very busy period , I have a few pieces of news, including one for any Bruce Springsteen fans out there, details of a great year for Straightpoint, plus how to reserve your FREE goody bag now! I recently spent a week in the States with our US office, visiting new and existing clients in Houston, New Orleans and Jacksonville. There are several interesting opportunities showing up in the US. I am proud to say that Straightpoint load cells are doing their part in the 2012 Bruce Springsteen Wrecking Ball Tour. Our Radiolink, Compound Plus system products are monitoring the raising and lowering of a giant 14,500 lb (6577 kg) big screen TV. The TV is raised and lowered by six electric motors, each employing the services of a Straightpoint Radiolink Wireless Load cell. The data from all six loadcells is being simultaneously monitored via Straightpoint’s T24LOG24 software from a simple windows based notebook. This is our first foot in the door of this broad-based market. Also, the new wireless centre of gravity system is creating quite a stir with many of the large steel fabrication companies. We’re looking forward to more exciting news from the US as additional vertical markets are explored. New Sign For Our New Building! As mentioned in a previous blog post, we’ve moved into a new, larger UK head office. 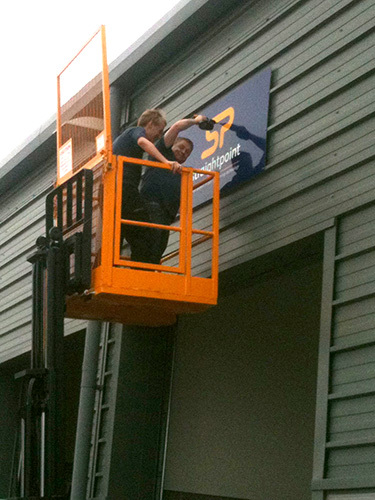 Here I am putting up our new sign (spot the new logo!) on our building! Collect Your Free Goody Bag at LiftEx! 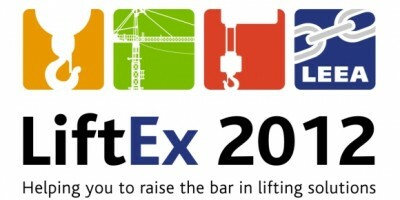 Come and visit us at the LiftEx exhibition this year (29th and 30th November in the Ricoh Arena, Coventry, UK) – we’re on stand 54 – you can’t miss us as we’re also sponsoring the exhibition bags! We’ll be demonstrating the wireless centre of gravity system, which helps you safely lift items with an uneven weight distribution by accurately calculating the centre of gravity. Plus, we have a limited number of free goody bags to give away – if you’d like me to reserve one for you to pick up at the exhibition, please email your name and company name quoting ‘LiftEx’. We’ve recently had all our six in-house test machines re-audited and verified by a UKAS laboratory. We already hold the ISO9001 accreditation – in addition, we’ve just passed a stage 1 audit for the UKAS-accredited BSI (British Standards Institution), that will meet virtually any international, European or British standard. We’ve just noted a record year, with sales up a massive 40%! During some of my worldwide visits, clients and distributors tell me they like our robust products, speedy delivery, and our friendly, efficient customer service, which have helped us to increase our business. If you have any further comments, we’d love to know what you think, too! (please send me an email with your feedback quoting ‘feedback0912’– we will send every person who emails feedback one of our Straightpoint mugs) This increase in sales is pretty unusual in this uneasy economic climate, so I just wanted to thank all our customers for their loyal support and custom.